On January 13, 1919, the Sixty-first General Assembly of Tennessee adopted Senate Joint Resolution No. 13. This legislation defined the mechanism by which an official state flower would be chosen. As a result of a statewide vote of Tennessee school children the passionflower was declared the official state flower of Tennessee. Fast-forward 11 years to 1930. In the early 1930s, flower gardening was gaining popularity in the state. Along with the increased interest in flower gardening came garden clubs and along with garden clubs came appreciation and fascination with the iris, a flower that had been cultivated for thousands of years. The Nashville Iris Association, established in 1931, gained national and even international attention for its efforts in breeding and growing irises. Nashville became known as the Iris City. With the growth of the garden clubs, the dissatisfaction with the passionflower as a representative of the state grew as well and the iris was promoted to become Tennessee's official state flower. Iris supporters claimed that the passionflower had never been officially adopted. Soon, the Tennessee Legislature joined in the promotion. "Be it resolved by the Sixty-eighth General Assembly of the State of Tennessee, the Senate and House concurring that the Iris be adopted as the state flower of Tennessee." Tennessee State Library and Archives. Adoption of the passionflower in 1919 was ignored. Joint Resolution No. 53 admitted no knowledge of the previous resolution adopting the passionflower selected by the school children of the state. Tennessee now had two adopted state flowers. Tennessee State Librarian and Archivist John Trotwood Moore, who had penned the poem, "Ocoee", to honor adoption of the passionflower in 1919, died in May 1929. His wife, Mary Daniel Moore, who had worked with him for many years, took over his position as State Librarian and Archivist. In a letter, dated December 4, 1933, she wrote. "The people have been so interested, and at the same time confused, as to which really is the flower or whether or not both are not the State Flower, that I requested the Attorney General's opinion on the subject that I might be able to give an intelligent answer to the many questions that were coming to my desk from the school children, teachers, women's garden clubs, etc. His decision is that the new law repeals the former law and the Iris is now the State Flower." 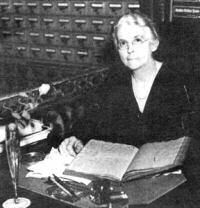 When the bill adopting the iris was publicized, there was an uproar. The passionflower, adopted 14 years earlier, in 1919, had not been forgotten. Garden clubs, botanists, and newspapers across the state all had something to say. "We have all heard about the 'war of the roses,' but now it is our duty to give the latest communiqués from the war of the iris and the passionflower....It is reported now that the iris adherents only lift their eyebrows when the passionflower is mentioned, and bad blood is known to exist between the factions representing the two State flowers." "The iris, beautiful as it is, is too much a citizen of the world be called the Tennessee state flower. And there are so many varieties of it you wonder which is ours. The Legislature did much better in its choice of a state bird [the mockingbird] by allowing the people of the state to express their preference. Since the Legislature unceremoniously 'kicked out' the passionflower, why shouldn't it reopen the matter at the next session and let the people vote?" "Garden club presidents from various parts of the state, meeting in Chattanooga recently, adopted a resolution favoring the passionflower as Tennessee's State flower." "We are glad that the Garden Clubs recognize that the State Legislature of seventeen years ago had better taste in State flowers than the legislature of five years ago." About six months later however, the position of the garden club presidents reached in Chattanooga was reversed at a Tennessee Garden Clubs convention. As passions ebbed and time marched on, the iris gained in stature as Tennessee's official state flower and the passionflower was relegated to history as the state's first official state flower. In 1935, "When It's Iris Time in Tennessee," by Willa Mae Waid was adopted as Tennessee's second official state song. In 1949, headlines were made when Governor Gordon Browning provided purple automobiles (honoring the iris) to the nation's other 47 governors for a National Governor's Conference. Twenty-four years passed. Then, in 1973, the issue of a state flower was brought up by State Senator Edward Blank. According to Senator Blank he was being urged to introduce the legislation to make the iris the state cultivated flower and the passionflower the state wildflower. He said, "The people of the good garden clubs across the state would like this resolved." Perhaps the most influential urging came from his mother, Mrs. Fred L. Blank, who was an active member of the Hampton Garden Club and the Tennessee Federation of Garden Clubs. To eliminate this confusion, in 1973 the 88th General Assembly, by Chapter 16, designated the passionflower the state wildflower and the iris the state cultivated flower. 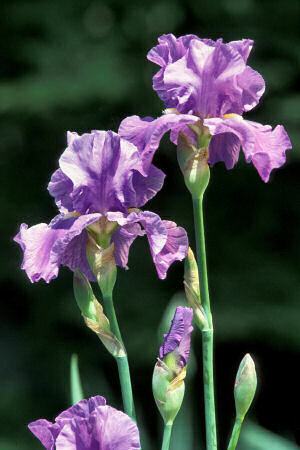 Legislation has never specified a particular variety of iris, but a variety of purple iris is usually depicted as representing the state's official cultivated flower. The following information is excerpted from the Tennessee Code , Title 4, Chapter 1, Part 3, Section 4-1-307. The iris, family iridaceae, is designated as the state cultivated flower. Iridaceae: Plants of the Iris Family. Plant Profile for Genus Iris L. (Iris): USDA, NRCS. 2004. The PLANTS Database, Version 3.5 (http://plants.usda.gov). National Plant Data Center, Baton Rouge, LA 70874-4490 USA. East Tennessee Iris Society: Home of the East Tennessee Iris Society. American Iris Society (AIS): The American Iris Society is a nonprofit institution incorporated February 2, 1927, in the County of Philadelphia, State of Pennsylvania. By the terms of the Charter, the Corporation has no stockholders and exists for the sole purpose of promoting the culture and improvement of the Iris. State Flower List: List of all of the state flowers. State Birds and Flowers Coloring Book by Annika Bernhard - 51 accurately detailed, copyright-free renderings include national bird (eagle) and flower (rose) plus 50 state birds and flowers. U. S. State Flowers in Cross Stitch by Gerda Bengtsson - Botanically correct cross stitch designs of state flowers of the 50 States. Quilting Flowers of the States by Sue Harvey - A lovely 12-inch flower block for each of the 50 states. Techniques used are piecing, appliqué, paper-piecing and three-dimensional techniques. Plants, Seeds & Flowers : Bulbs, seeds, plants, fertilizer, plant containers and more.